Coming soon: Share your fitting-room experience with friends, family, or anyone with Internet access. If you’re thinking like we are, you might recall watching episodes of The Jetsons and other futuristic science fiction programs and balking at the almost surreal-like experiences related through them. Well, possibly in the not-so-distant future, new technology will enable shoppers to send images from their fitting rooms anywhere in the world via the Web through a site called Shoptogether.com, which is not yet functional. This new technology was announced at the National Retail Federation’s 2007 Convention & Expo in New York. Here’s how it works. Shoppers will try on clothing in their fitting rooms, then walk into a common area with an interactive three-way mirror located nearby. 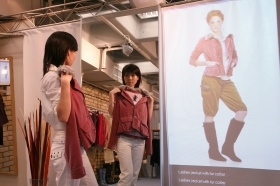 This mirror, called the Magic Mirror will communicate with the shopper’s cell phone using infrared technology, and the shopper would then be able to establish a Shoptogether session and show off his or her potential new wares to anyone in the world. People on the other end of the connection would, in turn, be able to offer comments such as “I love that outfit!”, “It’s not your color,” or others, which would be displayed directly on the interactive mirror for shoppers to see. Here are some of my own personal suggestions. The collaborators would then be able to peruse other items available for trying on via the store’s web site and offer further help. Humor aside, the generation gap between those who grew up with the Internet and those who did not seems to dictate whether people will embrace this technology or not. Mothers have expressed concern that people will have unauthorized access to the Magic Mirror, and perhaps perverts will be able to see their underage daughters changing. This concern is less so for young people, who think the technology is cool and convenient. Because many youths are insecure about their shopping choices, having collective input from their peers would help them in making the ‘right’ fashion decision. Personally I feel the technology is neat, but I’m pretty much the typical guy when it comes to clothes shopping and rarely feel the need to share my decisions with anyone. I imagine, though, this is niche-oriented toward women, especially young women and perhaps the fancier men out there, and I predict it will become very popular. Look for the website shoptogether.com to launch later this year (2007) at a Nanette Lepore boutique in the United States. How do you feel about this technology? Will people embrace it or shun it? Leave your comments here. The egocentric Me generation will love this surrounded-completely-by-technology concept. Hell, they can’t go anywhere they cannot talk on a cellphone while doing everything else ignoring everyone else around them (whilst imposing their loudness on everyone). That aside, I think people subject to criticism by strangers will not be able to take it so easy. So maybe this will damage a few egos. You know someone will say “girl, you’re just too fat for that”. Will the stores themselves like it? It seems this idea is to crowd more people into dressing rooms without buying (possibly too-high priced merchandise). Anyway, when I’m in a dressing room, I usually embrace the notion of privacy and that only I can see what I look like. They’ll probably shun it, but I wouldn’t mind it because I’m always asking my boyfriend for his opinion on my latest purchases. I could model it for him before I buy it. Too bad it seems to be only going into the stores I can’t afford/wouldn’t be caught dead at anyway. Hopefully, similar to MySpace and Nintendo WFC, you can have a code that you can give to only family and friends. The digital generation love new technology; however will it be economicaly viable for any retail outlet to offer such services to a diverse socio-economic community? I have conducted a fitting room survey of my own. My findings were as follows; the majority of women who used the fitting room were the Babay Boomers, Generation X and Generation Y.
I make an objective statement based on my survey; most women try on more than they are prepared to buy. They are insecure about the way they look and opt. for a second opinion.The fitting room is a social point for many women who shop in groups, and sales are lost due to differing opinions…. In contrast this survey found a difference between the behavioural shopping patterns of men to women. Men are assertive in their decisions and are not too concerned about appearances, and 98% of the time have purchased the goods being tried. The survey found the ratio of ‘women to men’ using the fitting room was 10 to 1; for every 10 women only one man entered the fitting room. I prescribe a socio-cultural infusion into fitting rooms, this strategy is affordable and economicaly viable for large and small retail outlets in any socio-economic environment. Implementing new technology will not embrace a cultural contact between the retail outlet and the customer. Money is better spent through training fitting room staff in fashion trends and creating a contagious cultural affiliation to fashion in the fitting room.